Once again another month has flown by and now I'm trying to find the time to get to this blog. As I write this, I am currently sitting in the ferry line up waiting to head over to Gabriola Island for quite the event at The Roxy. My uncle is performing "A Broadway Tribute" full of songs and stories from his childhood growing up on Toronto Street in Winnipeg. I spent a lot of time in that same house with my grandparents as a kid. It was always full of cats & dogs and peanut butter & honey toast. I spent my summers there, playing outside with the kids of Toronto Street. Although, unlike my uncle, I wasn't performing at Rainbow Stage, but that is where I learned to play the piano, as my grandmother was a piano teacher. A talent, I wish I had kept up. It was different growing up as there was always a piano around so I would sit and play all the time. 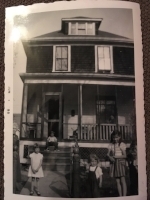 After my grandmother passed away, my grandfather sold that house and purchased one on Gabriola, where my uncle had already moved to. I briefly lived on the island when I was a teenager and for several months, when I moved out west twice as an adult. It has always felt like my home away from home away from home. There is a certain kind of magic there. It is also the place where I became a Yoga Teacher, just over 9 years ago! As the ferry is approaching Gabriola, I feel a sense of calm and peace. There's just something about being surrounded by the water that makes me feel so connected. After an unexpected lunch with friends, we all headed to the show. The venue was packed, the show was fantastic and it was wonderful to see my uncle in his element.